Our research of the copyright renewals database held at Stanford Universtiy indicates that this work is in the Public Domain due to a lapse of copyright due to the lack of a copyright renewal. Ha-Madrikh, having been published in the United States between 1923 and 1963, was required to have its copyright renewed within 28 years of its publication by the copyright holder indicated in the copyright notice: the Hebrew Publishing Company. This is a common condition for many works published during this period. We have digitally scanned this work so as to make it more widely accessible and to make it available for digital transcription. This manual has been devised for the express purpose of giving the Rabbi, or anyone officiating at a Jewish ceremonial or ritual, a concise and practical aid that will facilitate the task of officiating , and will obviate the necessity of resorting to the voluminous literature pertaining thereto. The prayers and texts used for recitations on various occasions are given in their entirety so that there is no need during a ritual to scan the book in order to complete a particular service: the instructions are given in chronological sequence, and the prayers and texts for recitation follow the instructions. The Midrashic and Talmudic excerpts given at the end of the volume bear upon the subjects covered in the book and are intended to serve as source material, for sermons and speeches for special occasions. The references indicating the sources will be of interest to those wishing further elucidation or information. The need for a practical manual of this sort has been long felt, and we are confident that this volume will accomplish the purpose for which it is intended. 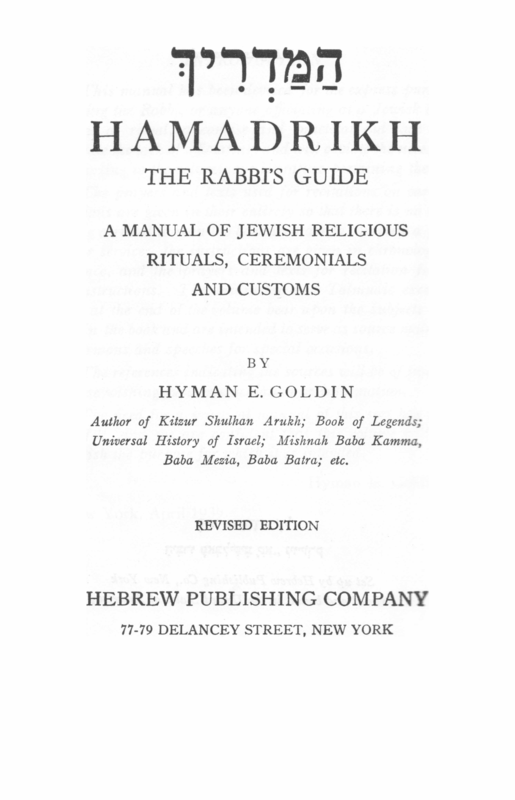 “המדריך | Ha-Madrikh: The Rabbi’s Guide by R’ Hyman E. Goldin (1939, rev. 1956)” is shared by Aharon N. Varady (transcription) with a Creative Commons Public Domain Dedication 1.0 Universal license. 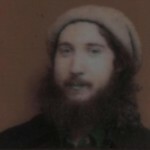 Rabbi Hyman Elias Goldin, LL.B. (March 15, 1881, near Vilna – 1972) was a Lithanian-American Orthodox Rabbi, attorney and Judaic scholar. A prolific author of English Jewish literature, he wrote over fifty works. Please reciprocate for any adaptation or redistribution of this work by (1) properly attributing the work to Aharon N. Varady (transcription) and Hyman E. Goldin, (2) clearly indicating the date you accessed the resource and whether any changes have been made (and if so, please be in touch with us and leave a comment below so that we might note your adaptation or improvement), (3) providing a link back to this source, and (4) specifying the Creative Commons Zero (CC 0) Universal license a Public Domain dedication under which this work was shared.